Mario Draghi’s comments on bond-purchases are nothing else than a verbal attack on the Euro as a part of global currency war. 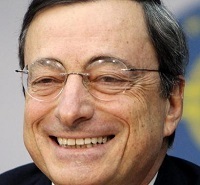 You don’t need to worry on ECB starting to print too much money, simply because it is already printing. And printing heavily. The latest results of Greece, Spain and Portugal bond sales showed an enormous demand and that led to very low interests paid on them. For countries that are de facto defaulted this simply means someone with “easy money” has appeared on the market and is buying. And that is exactly equivalent of quantitative easing. In fact ECB is printing and flooding the market via the mechanism of lending banks cash at low interest rates. With artificially low rate of 0,25% banks simply take this money and lend it to governments at 2-5% interest depending on borrower. They are instantly making a profit of 1,75-4,75% at no risk. Bonuses for famous and genius bankers are granted. Most of EU banks are under heavy government regulation and therefore are politically dependent. Even if there is a banker that decides to avoid this obvious madness, he will be very easy to repress and change his mind. In fact much banks are even owned by governments so there are guaranteed channels of driving ECB money to the deficited budgets. If there was no printing, ECB would have to find this money from somewhere, i.e. from depositors. In the times of the gold standard that was the only source of cash. But at 0,25% no one would deposit, so there would not exist financing for bankrupted governments at 2-5%.